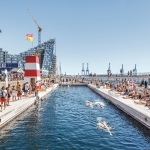 Aarhus Harbor Bath is an extension of BIG’s current development plan for Aarhus’ new waterfront neighborhood named O4. 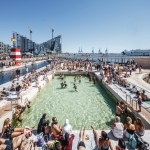 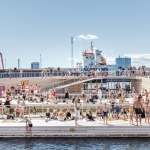 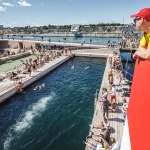 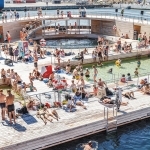 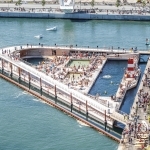 Similar to BIG’s first harbor bath in Copenhagen from 2002 which has come to define the Danish capital as one of the most livable cities in the world, Aarhus Harbor Bath and adjacent Beach Bath provide new ways for the public to enjoy the water in all seasons. 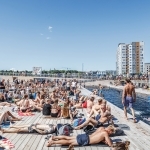 Together with urban life expert Jan Gehl, our strategy was to create a framework for maximum amount of life with the minimum amount of built substance. 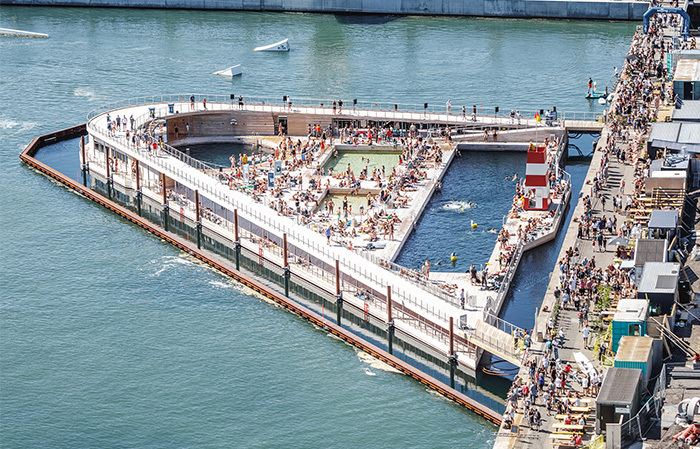 The harbor bath zig-zags gently into the island, extends all the way out into the harbor pool and back again. 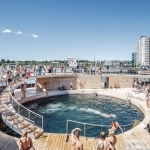 The swimmers can enjoy the circular diving pool, a children’s pool, the 50m long lap pool or one of the two saunas that are tucked underneath the public boardwalk which doubles as a viewing platform who those who prefer to stay dry. 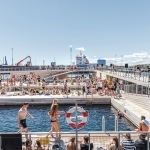 In front of the bath, a series of freestanding restaurants, a children’s theater, beach huts for various activities and other life-creating public oriented programs were designed before the private buildings blocks which will rise in the coming years. 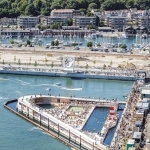 As a result, the private residential buildings at O4 become subordinate to the needs of the public realm. 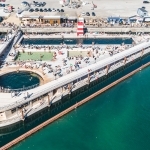 Aarhus Harbor Bath gives the residents and visitors of the island a more engaging and adventurous waterfront experience who can use the harbor bath not only in swim shorts but as a walkway that extends the public realm into the water, breathing new life into an area historically reserved for industrial purposes.